Did you know you can make your own Super Soil Hydrogel using Diapers? You’ll love this Diaper Soil Plants Recipe and so will your Plants. Watch the video tutorial now. We were totally amazed to see how Diapers can help your plants grow and you will be too! This idea will save you time and it’s environmentally friendly. It reduces landfill by using disposables. By following the steps, you’ll be able to make a totally non-toxic Super Gel to improve your garden and reduce your watering by half. 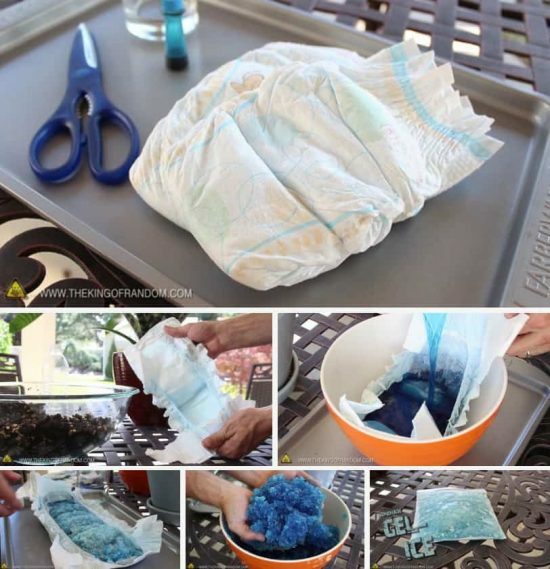 All you need is a disposable Diaper (new or ‘gently’ used), Water Crystals and some all-purpose Potting Soil. As you know Diapers absorb liquid but you may be surprised at exactly just how much. In the tutorial, the diaper absorbed 4 cups of water in just seconds. We have included Grant’s video regarding making your own Super Soil and we highly recommend that you watch it. Once you have your Hydrogel, it’s time to turn it into super soil. You need some all-purpose potting soil and a large mixing bowl to dump it in. Add equal parts of dirt and gel, then begin working the two together until they’re thoroughly mixed. Now you’ve not got a super absorbent, super soil that’s light and fluffy. It’s perfect for your potted plants. Throw a little soil into the pot first, then help your plant get comfortable. To hold it firmly in place, just keep packing more soil until everything sits tight. You can finish up by giving the plant a bit more water, and now with the super crystals in your soil, your plant can go twice as long between waterings. In the event of extreme overwatering, ordinarily, plants would drown or begin to rot. This is where hydrogel soil rises to the occasion. Being infused in the soil, the excess water is quickly absorbed, keeping the soil damp and fluffy, and potentially saving your plants. One of our favorite tips is Grant’s final idea and that is to preserve your fresh cut flowers by adding sugar, vinegar, and a bit of bleach to some warm water. This will create a homemade flower food and when you add your slush powder, you’ll see it absorbs the solution and slowly grows up to 60 times its size. By agitating the gel, you can create an awesome effect that looks like crushed ice. Another great idea for watering that we thought we would share is this Plastic Bottle Drip Feeder from Dream Garden 101. This will come in handy particularly if you are going away for an extended period and for those plants that are not so easily accessible. All you need to do is put some holes in the bottle, fill it with water and bury it with the plant or in your garden. The smaller the holes, the slower the release of water. Be sure to leave the lid off too. Here’s another easy and inexpensive tip for using Diapers around your garden – pop one in the bottom of your hanging basket to retain moisture and stop your baskets drying out. Want more? See how to do your own Soil Test here.